The small intestine is involved in the digestion, absorption and transport of food. Food breaks down further in the small intestine after passing through the stomach, and the absorption of vitamins, minerals, carbohydrates, protein, and fat takes place. The small intestine is the largest part of the gastrointestinal tract and is composed of the duodenum which is about one foot long, jejunum (5-8 feet long), and ileum (16-20 feet long). The duodenum is the major portion of the small intestine where enzyme secretion takes place. The small intestine secretes sucrase (breaks sucrose into glucose and fructose); maltase (breaks maltose into glucose); and lactase (breaks lactose into glucose and galactose – lactase is missing in many people). It also secretes peptidase to split peptides (from protein) into amino acids, and lipase to break down fat into glycerol and fatty acids. The duodenum receives bile from the liver and gallbladder, to decrease the surface tension between the large fat globules and water, and break them into smaller globules that can be acted upon by lipase. Lipase, amylase, trypsin, chymotrypsin and sodium bicarbonate are received from the pancreas upon hormonal signals from pancreozymin and other hormones (produced in the small intestine) and neural signals from the vagus nerve. Epithelial cells in the small intestine secrete over half a gallon of a neutral fluid daily to supply a watery substance to mix with the chyme and provide a substance to aid in electrolyte and vitamin absorption through the villi. Brunner's glands in the duodenum secrete mucus in response to secretin, vagal stimulation, and direct stimulation of food in the small intestine. This mucus protects the duodenal wall from the digestive juices. Goblet cells in the mucosa also produce mucus. Approximately 50% of the carbohydrate digestion is performed by amylase from the pancreas, 40% by amylase from saliva, and 10% by intestinal amylase. About 95% of the fat digestion is performed by pancreatic lipase and 5% by intestinal and stomach lipase. Villi and microvilli line the small intestine and increase nutrient absorption by dramatically increasing the surface area. Almost 90% of our daily fluid intake is absorbed in the small intestine. The small intestine is covered with villi and microvilli, which increase by a factor of 600 the surface area of the intestinal wall exposed to chyme. The increased surface area makes the small intestine very efficient in absorption. Capillaries in the villi absorb amino acids, glucose, fructose, and galactose while lacteals absorb fatty acid and glycerol to travel through the lymphatic vessels. As chyme enters the small intestine, its acidity causes secretion of the hormone secretin, which signals the pancreas to secrete alkaline juices to neutralize the chyme. The chyme also initiates a type of small intestine contraction known as segmentation which helps to mix and chop the chyme and propel it along. These contractions occur about once every 5 seconds in the duodenum but only half as fast in the ileum. Peristaltic waves also occur and aid in chyme propulsion. It takes about 2-3 minutes for the chyme to advance 1 inch; food will normally remain in the small intestine for between 3 and 10 hours. Harmful irritants reaching the small intestine can initiate what is called a peristaltic rush which can empty the entire small intestine into the colon within a few minutes. Food that you are allergic to can also do this and lead to diarrhea due to the lack of time for fluid absorption. Some causes are related to the liver, pancreas, gallbladder, and stomach, all affecting digestion in the small intestine. The cause must be determined. Nerve pressure in the lower thoracics can affect small intestine function. Stress can alter enzyme secretion and cause dysfunction. Antibiotic therapy (for infections, etc.) can kill off helpful bacteria in the small and large intestine and can cause an alkaline gut where harmful gas producing bacteria will proliferate. Lack of HCl will contribute to this also. Spices, alcohol and caffeine can cause irritation and result in oversecretion of mucus in the small intestine. This can "plug" the villi and decrease vitamin and mineral absorption leading to various deficiencies. In this case even a healthful diet won't be assimilated properly. Increased HCl secretion in the stomach up to 15 times normal. Stress causing increased sympathetic nerve flow and decreasing secretion of mucus from Brunner's glands. An overworked pancreas from overeating, eating between meals, etc., not secreting enough bicarbonate. Eating any food you're allergic to can cause disturbances in the small intestine. General symptoms of small intestine dysfunction include abdominal bloating and pain, gas, diarrhea, nausea. Lactase deficiency can cause gas, nausea, bloating, cramps, diarrhea, asthma, congestion, on ingestion of dairy products. It is thought by many that congestion in the lacteals and lymphatics of the small intestine contributes to narcolepsy. Symptoms of duodenal ulcers include midmorning and middle of the night pain relieved by eating. The pain lasts for 1-3 weeks at a time and then subsides. 15 minutes before each meal take one-quarter teaspoon of high silica clay to "scrub" out the mucus. If there is mucus in your stool from this treatment, don't be concerned. Make sure your liver, pancreas, gallbladder and stomach are functioning properly. Garlic will kill harmful intestinal bacteria and promote the growth of beneficial acid-producing bacteria. If you have eaten too many irritating foods and suspect your villi to be "plugged" and your absorption decreased, two things may help: Take a mixture of comfrey leaves and papain (the milky white sap from the stem of the papaya, also plentiful in green papayas). The papain will dissolve the mucus while the comfrey will heal the membranes. Do this for one week, once daily with one-quarter of a cup of the mixture. Slippery elm tea is reported to be beneficial against inflammation of the small intestine. Charcoal tablets and anise tea both are effective in relieving gas. Avoid spicy food, caffeine, alcohol, refined carbohydrates (sugar, white flour, white rice) so you won't oversecrete mucus and decrease your absorption. Eat lots of raw fruit and vegetables to promote growth of healthful bacteria. Acidophilus is essential in the absorption of nutrients from our food. 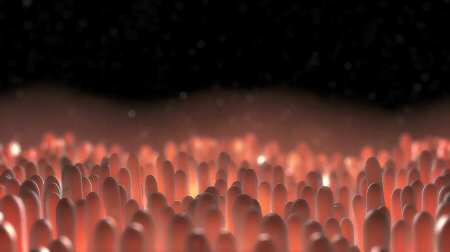 It colonizes the walls of the small intestine, secretes substances that help maintain a balance of intestinal microflora (by creating a favorable environment for the growth of beneficial flora), and helps keep the intestinal wall functioning properly by keeping clear the spaces between the microvilli so that they can function efficiently. Acidophilus also promotes proper peristalsis – the normal movement of food through the small intestine. The beneficial flora dramatically influence metabolism and overall health.